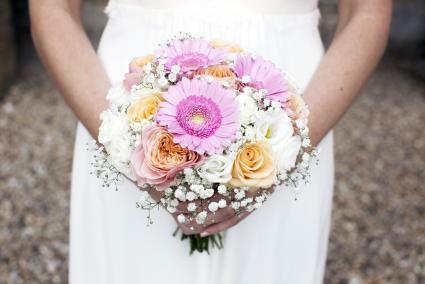 Known as a flower for all seasons, Gerbera daisy bridal bouquets are a beautiful and versatile option for any bride. 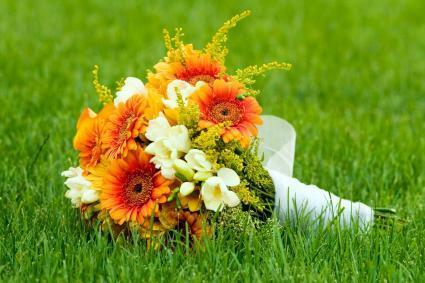 Gerbera daisies can be used alone as a lovely, natural looking bouquet, or they can be mixed with other flowers, greenery, and accents for more formal arrangements for the bride and bridesmaids to carry. A Gerbera daisy is characterized by its striking look of longer petals and a distinctive center which is actually composed of hundreds of flowers. 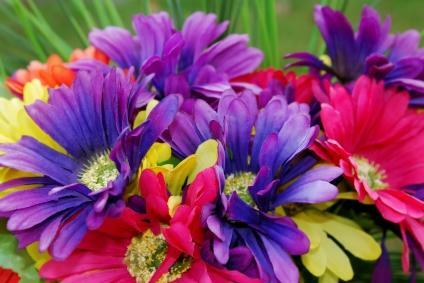 Depending on the hue the flower may look delicate or bold, but in any color this flower is not only a lovely, but also economical, option for a daisy theme wedding since it blooms repeatedly throughout the year in mid-spring, mid-summer, and mid-fall. Many of these daisies also contain multiple hues within a single flower, giving them a distinctive and original look. The centers are often black or dark in color, although yellow centers appear in the daisies as well. An experienced florist can also dye white Gerbera daisies a different color to match your wedding if desired, or silk flowers are available in additional colors. If you consider this minimalist option, the result can be stunning as well as affordable. Carry a large, unblemished bloom in a bold hue with a dark center for beautiful contrast against a white or ivory gown. With its broad range of shades, the effect of a multi-colored Gerbera bouquet is fun and festive. This can lend the perfect touch to an informal wedding, or be a bold color surprise for a black and white or monochromatic wedding theme. 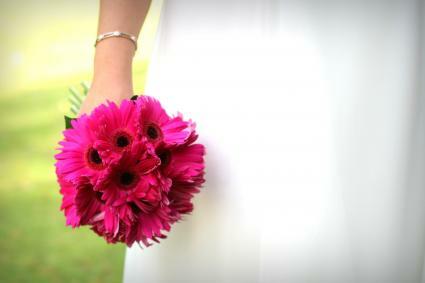 Some brides carry this effect through with each bridesmaid carrying a different colored Gerbera daisy or daisy bouquet. Wedding bouquets with daisies and roses together are lovely and romantic, especially in posy, nosegay, or other circular shapes. The roses may complement the colors of the daises or they may be the same color, just other shades. 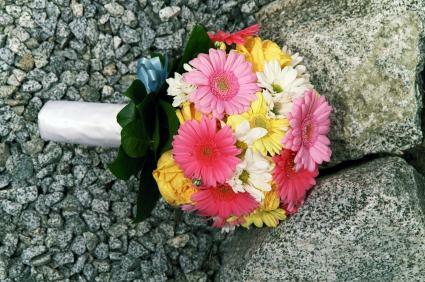 Since Gerbera daisies have many advantages they can be an excellent choice for the bridal bouquet, as well as for the church décor and wedding reception centerpieces. 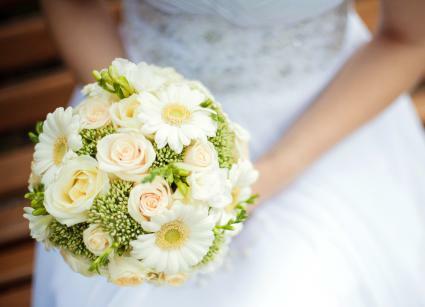 When choosing a bouquet with these daisies, a bride should carefully consider the colors, arrangement, and accents in order to fit with the theme and feel of her wedding. As a cousin of the sunflower, the Gerbera offers a wholesome, natural feel, making it an obvious choice for outdoor, garden, country, or western-themed weddings. A simple wedding bouquet with the daisies or the addition of wildflowers can make a wonderful, no-fuss arrangement perfect for summer weddings. 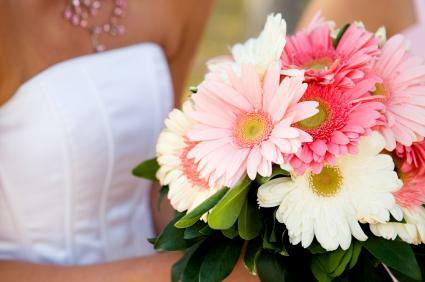 Gerbera daisy bouquets can also work with formal weddings as well. The bold color contrast between the dark center and colored petals offer a look that can be quite contemporary and gel nicely even with a black tie wedding atmosphere. For a more formal feel, choose arrangements that have a polished and pulled-together look. The bouquet can be finished off with additional flowers in similar color families and embellished with coordinating satin ribbon for a sophisticated feel. While a fresh bouquet is beautiful, it does need extra care. Faux daisies can be purchased if you need to transport them or want them to last without any worry. 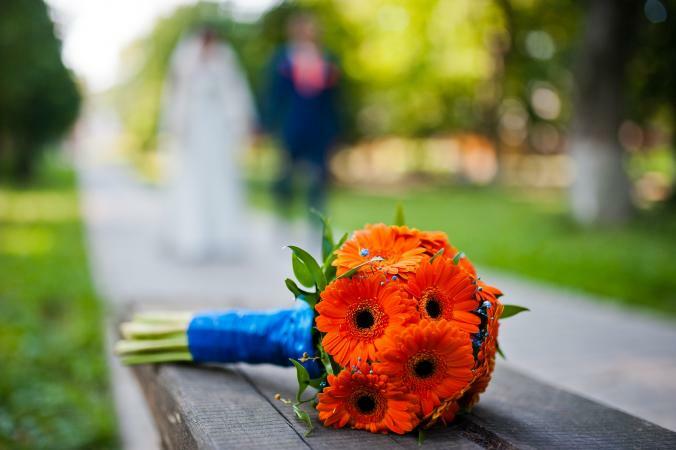 Though these flowers are beautiful and versatile, brides need to be somewhat careful with their Gerbera daisy arrangements and bouquets, since they can become damaged if improperly handled. While the cute blooms should stay fresh for seven to ten days if properly treated and hydrated, the daisies have a tendency to turn towards the light, so they should be wired or heads suspended prior to the wedding to keep them straight. Take care to avoid over-handling the flowers since the petals can bruise easily. 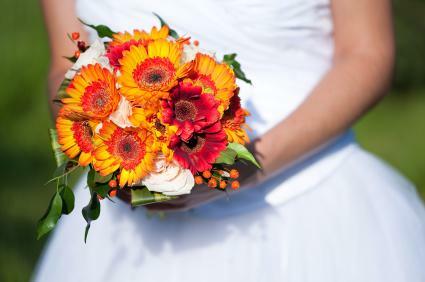 Silk wedding flower bouquets can take some stress out of wedding flowers, and like their fresh counterparts, silk Gerbera daisies come in a stunning array of hues to coordinate with your special day. Silk makes a great choice for those who want the Gerbera in a color it does not come in naturally, such as blue or purple. These are available at affordable prices at most major craft retailers, or online at sites such as Budget Bride. The cost of these playful flowers is significantly less than popular options. Florist Chronicles points out their affordability over other more costly blooms. Prices will fluctuate based on season, region, and availabilty, but you can expect to pay about $2 to just over $3 per flower. 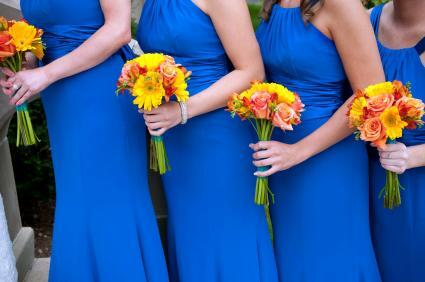 Mini sizes may cost less and add some depth to your bouquet. Whether you choose fresh or silk flowers, versatile Gerbera daisy bridal bouquets can add the perfect touch of beauty and drama to your wedding. The playful bloom offers an alternative to traditional roses and lilies that can be elegant and whimsical.